The line-up for the Skegness Darts League’s Lowe v Mitchell extravaganza has been confirmed. Gordon Smith won the final qualifier at the Liberal Club on Sunday to book his place in the team competition, where sides will be skippered by pros John Lowe and Scott Mitchell. But there needed to be a nine-dart challenge to determine who would be the final points scorers to progress. Lee Woods, Nathan Careless, Wayne Clarke and Mark Simpson competed in a tense shootout, where Careless and Simpson progressed with the highest two scores, following a four-way tie on 10 points. The six round winners who will all compete are Terry Cox, Mark Forman, Darrell Webb, Sam Hewson, Carl Abbiss and Smith, while high points scorers Spencer Davis and Chris Fletcher will also make the final. The 10 finalists playing in the pairs section will be Scott Sutton, Lee Yates, David Tuplin, Wayne Burles, Kyle Davis, James Richards, Rick Seaman, Wez Elston, Simpson and Careless. A total of 29 players lined up looking for a place in the March 1 final. Wayne Clarke claimed wins over Rick Seaman (both hitting 180s) and Hayley Reeson before being beaten 3-0 by Smith. Smith went on to beat Spencer Davis 3-0 in the semi final, hitting a 152 checkout in the process. 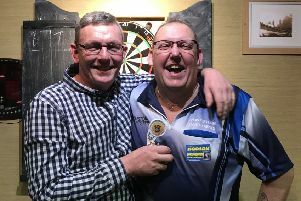 The other half of the draw saw Nathan Careless brush aside all in his path as he stormed into the final by beating Glyn Pope, Eric Hammond, Mark Carter and semi-finalist Braydon Wyeth. Wyeth earlier threw 109 and a 139 finish against Wez Elston. A cracking final saw Smith win 3-1 to book his place in the teams contest. The two teams are yet to be decided. Cein Rymer will sponsor John Lowe and his team and Stuart Hodson Tyres will back Scott Mitchell and his team. A round robin competition will be held on Sunday at Seaview Skegness, with registration from 1.30pm.